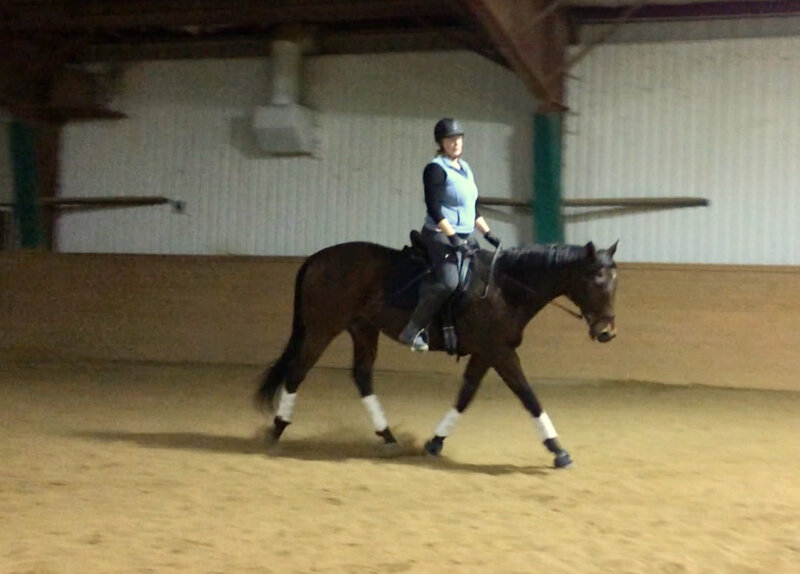 We had our first lesson at the new barn with Christy last night. I’ve ridden Derby exactly once in the last two weeks, and prior to that, we had time off over the holidays, so I really wasn’t sure what we’d be able to do for her. However, all the rides we have had in the month since moving have been really nice, so I was optimistic. Christy was really happy what she saw. She picked at a few things but for the most part we had a solid ride. She did find and fix issue that I had overlooked pretty quickly, however, and it made big difference. 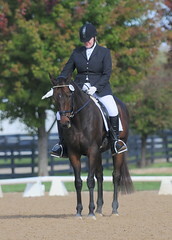 I was allowing my legs to rotate outward from the hip, and not draping them around the horse. I discovered that I had my feet cocked at an angle in the stirrup, too, placing more weight on the outside edges of my foot. Focusing on stretching down through my leg, through and out the ball of my foot, solved the problem pretty quickly – my legs were draping and more effective right off the bat. I need to school this because I’ve let it slide over the last month, but it’s something I can work on independely. Speaking of independent work, I diagnosed and fixed a saddle balance problem all by myself recently. I’ve been well schooled in saddle balance by Christy, and I noticed a couple weeks ago that things were feeling a bit out of whack, as I was starting to try to climb over the top of the pommel when I posted. I was on the lookout for changes in saddle fit, as Derby is getting better turnout (larger group, and larger paddock) and much better food. I applied some of the tests for saddle balance I’ve learned from Christy, including her “stand-stand-sit” test which is a stone-cold truth-teller about how well your saddle was balanced, and yep, it was a struggle — when your saddle is balanced, you can do laps of stand-stand-sit easily, without batting an eye. I took my saddle home, got a screwdriver and my shim kit (if you’re a new reader, I ride in a newer Bates Isabell with the Riser System) and swapped the 8mm forward shim for the 4mm version. It’s only a 4 millimeter difference on either side but changing the shim produced a magic effect – I’m in really good balance now and the horse also approves – he tells me by moving easily and giving me his back. I’ve seen a big change in Derby since moving to the new barn. He hasn’t put a foot wrong – no spooks – and seems relaxed and happy. Our rides are our best ever. I know the footing at the old barn was bad – it was hard, it would freeze, and the barn owner didn’t groom the ring regularly. In retrospect, I think it make moving downright painful for the horses. However, what I didn’t realize is the footing affected more than how the horse moved – it affected my ability to ride in a balanced, connected manner that was safer, too. Anyway, I’ll be apologizing to Derby for not moving him sooner. I’ve only recently realized how I dreaded going to the old place, if only because going to the new barn is a joy.